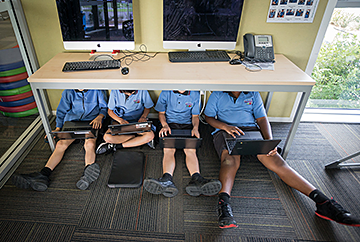 Recently, the news has been awash with wonderings and reports of schools going online as a way forward. As a modern learning pedagogy enthusiast and someone who believes in strong technology use within the classroom, you would think I would be fully behind the announcement. And I am. But, we must not lose sight of one of the most fundamental elements of learning. The very best piece of technology a student will ever have access to is a good teacher. The context of the drive to establish communities of online learning has perhaps been lost in the responses to the original announcement. Here we are faced with the opportunity to respond to the ever-changing needs of students, and keep them entirely at the centre of learning. We know that technology is not the silver bullet. It is often described by those less inclined to use it as ‘being as effective as giving a fish a bicycle’. But, is this the real picture? 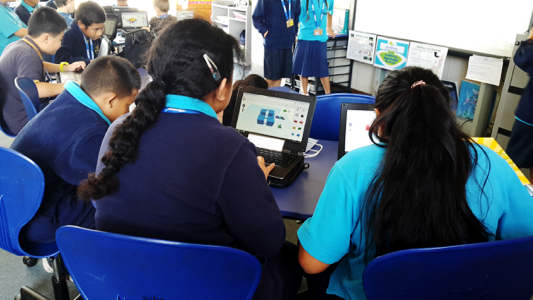 Once the engagement with the device as a shiny object has subsided, we can really begin to unpack just what learning with digital technology can do for our learners. 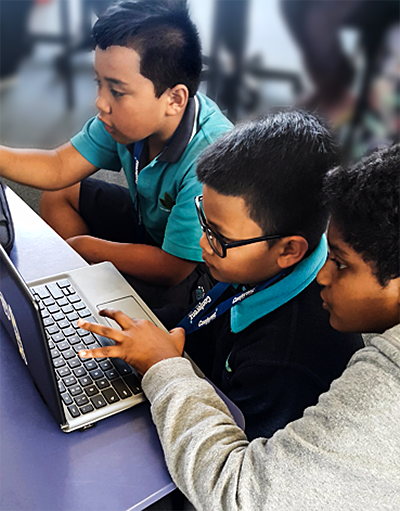 The key areas are perhaps summarised best by the Woolf Fisher Research Centre’s ongoing research with a progressive cluster of low-decile Auckland schools. These areas have become known as the ‘five affordances of digital technology’ and stem from over three years’ worth of professional research into the use of technology to accelerate student progress and achievement. Very recently, I was fortunate to have the opportunity to unpack the affordances with a group of senior teachers and school leaders. All of these are currently in the second year of a three-year supported programme focused on raising student achievement and making accelerated progress. This is underpinned by a shared cluster pedagogy and a base of visibility through access to technology. After the box has been unpacked and the glow of the device has subsided, what is left? Just how can using an internet-enabled device in a well-organised 1:1 programme add to student engagement? We know that intrinsic motivation stems from learning that has high levels of interest or opportunity to explore curiosity (Woolfolk-Hoy and Hoy, 2009), so, perhaps the first area to unpack with regards to engagement is authenticity. Having access to the wider world and the understanding that a piece of work is not finished when it’s handed to the teacher, means that students have the opportunity to engage with an authentic audience. In context, this could be as simple as preparing a speech on world poverty and famine. Previously, the student would write and present the speech to their peers, and then receive their feedback before moving on to the next topic of study. Having an internet-ready device opens up a world of possibilities. The speech can be blogged for others outside of the school to see. It could be recorded and shared via a multitude of audio and video hosting platforms with the intention of reaching those who can actually make a difference. Just recently, this very scenario happened. An intermediate level student shared their writing about equality and the lives of refugees to their blog. The post was automatically tweeted by the cluster account and within an hour had been read and retweeted by a small human rights organisation based in Europe. The connection came to life and the writing had, very quickly, gone far beyond the walls of the classroom. This example alone feeds well into some of the other areas felt to be related to student engagement. The writing had been completed both in and out of the classroom, researched using sources from across the globe, and curated for relevance. The learning had become relevant, meaningful, and powerful; engagement was simply a wonderful by-product. 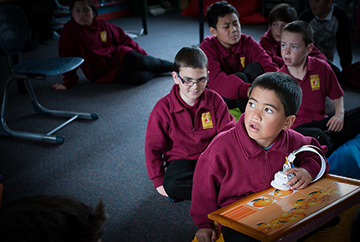 Something New Zealand teachers do well is conferencing with students. 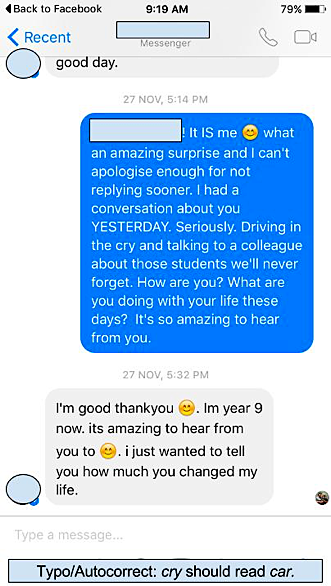 Since moving to NZ over six years ago, I have been shown the value of purposeful, powerful teaching conversations between students and teachers. So, how can digital technology improve something that is already very strong in many learning institutions? Having access to learning via a device means that students have the opportunity to learn anytime, anywhere, and any-how. They continue their journey on a ubiquitous platform of lifelong education, underpinned by the access their device affords. Both the student and teacher have this access. Teachers in 1:1 environments have the opportunity to comment, unpack, and question student learning without being constrained by the ten-minute window to talk during the working day. When that face-to-face window finally comes around, the conversation has already begun online (through commenting and collaboration) and can be instantly focused. 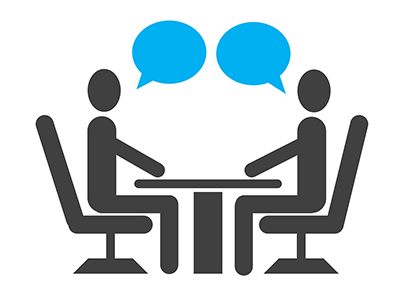 Simply recording the conversation with an audio tool means the student can return to it at any point and listen again to the feedback and discussion around their learning. The face-to-face, human interaction is not lost, merely extended. Aside from not being limited by the space on the page, students have the opportunity to evolve their learning based on their understanding of an authentic audience. As they begin to explore blogging and publishing online, there is a need to think about what a ‘global audience’ really means, and how it can affect their outcome. We know that students learn in a variety of ways. Having access to multiple tools, with the expert guidance of a skilled teacher means that learning does not end when the work has been written and edited. The ‘final piece’ can now be presented as a piece of a much larger puzzle, showing research, conversations, editing, commenting and alternative ways to present- all feeding a multimodal learning outcome for an audience to interact with. Something else that needs to be considered is ownership. Student engagement is known to be higher when there is a feeling of ownership of the learning that is taking place. Students who understand how they learn are able self-scaffold their learning, increasing or decreasing its complexity to suit their needs. Under guidance, this can not only increase the complexity of learning taking place, but also tailor or differentiate it to a self-selected level and add considerable value. In placing learning onto a visible and accessible portal, students are able to access it at a pace and time they feel most comfortable. Most teachers I meet have become experts at planning the tasks and steps needed in order to achieve a predetermined final outcome. However, for those that learn differently, having access to ongoing learning both in and out of school hours, coupled with a strong grasp of how to access information, there is the possibility to learn around an area and build a much wider understanding. Potentially, students are able to develop a clearer perception of themselves as a learner and apply this to future situations, without the need to have the processes carefully constructed by a teacher. 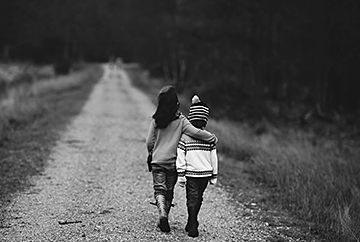 They are able to take responsibility for accessing the methods that they have found to be successful and use them when confronted with new and unfamiliar contexts. Perhaps the most obvious affordance of digital technology is the ability to connect and make learning visible. As a teacher, there is the opportunity to share planning, activities and learning outcomes via a class portal. Not only are parents and caregivers able to see this and provide support, but also other teachers and colleagues, who are able to adapt and extend the ideas to meet the needs of their own learners. In making their learning visible, students are able to make their learning ‘real’ and purposeful. The new connections have the potential to drive learning to a level well beyond the initial plan. 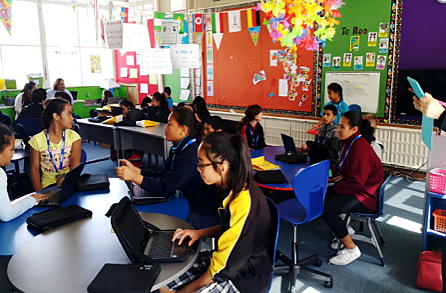 Sharing authentic writing and learning via a blog allows students to develop meaningful relationships with students from the classroom next door just as easily as with students from a classroom halfway across the world. Bringing technology and digital learning into the classroom must never be about learning the tool. While understanding how to use a device effectively remains important, the learners of today already have many of the skills needed to navigate the online world as a consumer of information. As 1:1 device rich environments grow, we have a real chance to make today’s learners creators of knowledge and information for their peers of the future. Whatever your view on the use of technology in schools, the fact remains that technology on its own cannot accelerate student progress and achievement. Without a teacher with strong pedagogy, the fish and bicycle scenario remains. With a teacher with strong pedagogy, the possibilities, in my humble opinion, are limitless…. Do you remember this sort of acronym? Watching the ‘well-behaved’ students being rewarded and praised for their listening, or being praised yourself for not making any noise? It very much reminds me of the quiet assembly line, industrialised education with a one-size-fits-all product at the end of a process, led by teacher instruction. Seeing this in a classroom recently made me begin to wonder… Do we sometimes confuse good manners as good learning? Perhaps it’s a case of unpacking the meaning behind what it is to shine at school. Our very purpose is to educate our students. Whether this is providing them with the fine motor skills and phonics to access learning, or to unpack advanced pure maths at NCEA level, we have a duty to engage and enable our students. So, does this mean that sitting nicely is shining? 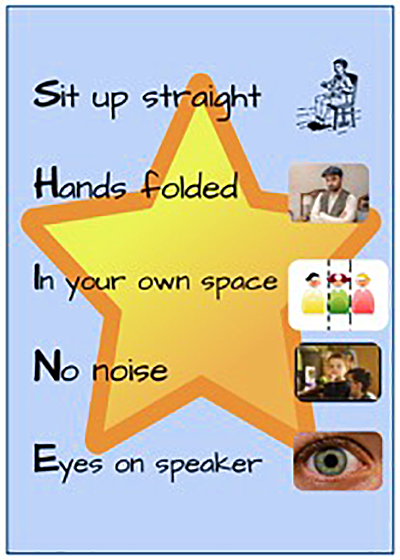 Or perhaps, making no noise is an example of a shining learner? I am, of course, being facetious. As we baulk the trends of the industrialised education model in favour of innovative learning and opportunity, it seems strange that this mantra can still exist today. Can it not now be said that a shining student is one who ‘thinks things that have never been thought, to solve problems we do not know exist?’ A true shining student is one who innovates, one who evolves, and one who shows resilience in the face of failure. Risk taking is hard, it promotes failure and learning from it. It creates hindsight and powerful short and long-term memories from which our personalities grow. Sitting nicely with folded hands is, in my opinion, not indicative of a risk taker, nor an innovative student. Shining now often means learning through experiences. Creating and failing in order to inform learning and create again. These processes are, at best, a little (and, at times, a lot) noisy! Sitting quietly with folded hands reminds me of an old expression my grandmother once used: “Children should be seen and not heard”. And, within her generation, as a product of a regimented system of education ruled by the teacher and fear, she was correct. But times have changed. Changing teaching practice to meet the needs of the learner has been well researched in recent years. Our role is to educate the child, not force the child to fit the curriculum. How many learners show excitement and wonder quietly? How many of us would be disappointed if we tried to engage our students only to be greeted with an assembly line of identically sat children, hands folded, in their learning place on the mat, making no noise and staring forward? Personally, I find the thought of it rather eerie. We have a duty to make the learning fit the needs of our students, not the other way around. So, why do the expectations of some, when thinking about student behaviour, still reflect this? Perhaps a new acronym is needed — Shine 2.0. Some days, it can be hard not to confuse good manners with good learning. But, perhaps you should stop and just watch your students for a moment. Question whether those who are sitting beautifully really understand what they are being asked to complete. Or, is their behaviour a learned ‘coping-mechanism’, and one that more often than not brings them reward. A good friend and incredible teacher I once worked with said, ‘Learning is messy.’ And, do you know something?… She was right. Teacher A (a Beginning Teacher) is upset about the behaviour of the students she teaches. There has been a notable decline since the beginning of the week, due to lack of outdoor time and disruption of the calendar because of inclement weather. Her students are making choices that seem to show they do not value the learning or the learning environment. Teacher A is visibly upset and harbouring a growing feeling of failure. She turns to Teacher B (a senior teacher with many years’ experience) for support. Pause and take a moment to ask, what you would do in this situation. How can you reassure your colleague without over-sheltering her from some of the hard truths she has yet to learn? As an experienced professional, it certainly crossed my mind that it was not something that Teacher A needed to be or should have been particularly upset about. It is common for student behaviour to decline when outdoor time is limited. One of the first expressions I found myself thinking was, ‘stir-crazy.’ But is that okay? Is it right for me to dismiss the feeling of my colleague because she is disappointed in the choices being made by her students, when my experience tells me it’s common? Of course not. Whether I, as a leader, would be upset by the same scenario is not particularly relevant. The fact remains, she is, and has turned to me for support — not to be told it’s ‘one of those things’ and to ‘brush it off.’ Furthermore, other issues the teacher may be experiencing are not being taken into account. For example, it’s the middle of the second term and she is a Beginning Teacher in her first year at a new school. She has also just finished writing reports for the first time in her career, and feels like she has had to rewrite them all after peer review. Everything is new, each inquiry, each topic, each success and failure. She is well within her rights to be utterly overwhelmed. 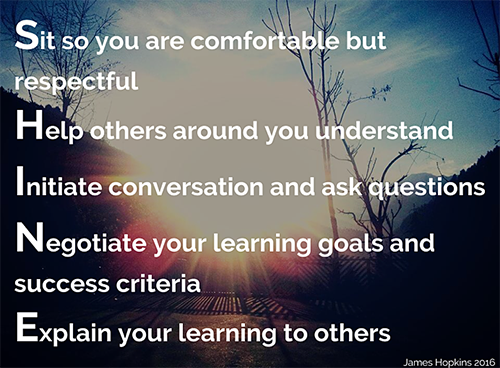 Although we choose to lead in different ways and by using different leadership models to inform our practice, there are many simple strategies we can draw from. Listen — Let them vent and let them speak freely. Sometimes our colleagues just need to let off steam and share their frustration. Offer nothing but your thanks for their honesty. Ask yourself what they are saying and whether it’s what has really upset them — Often, we begin to share our frustration with a situation, but it is merely the ‘straw that broke the camel’s back’, masking several other issues that, given time, may rise to the surface. Do not invalidate — You may have been through a similar experience and survived, but dismissing their emotions as unnecessary, or, offering an ‘it’ll-be-fine’ response could be detrimental to the moving forward process. Wait — Do they need you to actively help them in this situation or simply listen? 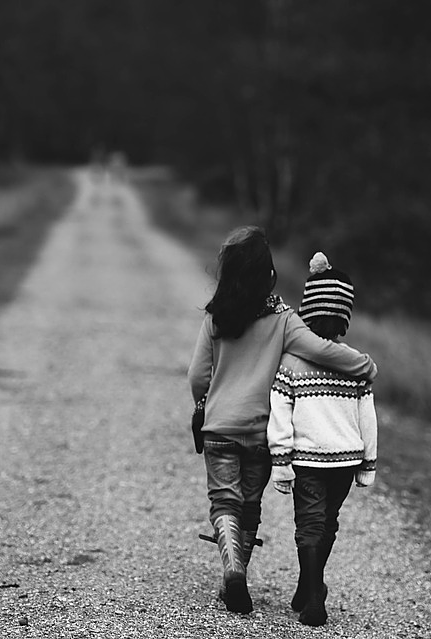 Instead of leading in with, ‘Well, this is what I’d do…’ ask ‘Would you like some advice or help with this?’ Allow them to make the decision to take the next stage of help. Hall, Karyn. “Understanding Invalidation”. Psych Central.com. N.p., 2012. Web source. I paused this morning, a much needed stop after a week of tremendous pressure and workload. As the world passed by around me, I began to wonder about former students. Those I have impacted, shared with, and taught. How much of an effect did I really have? How often do we, as educators, see what they become? And it reminded me of a message received out of the blue before Christmas. 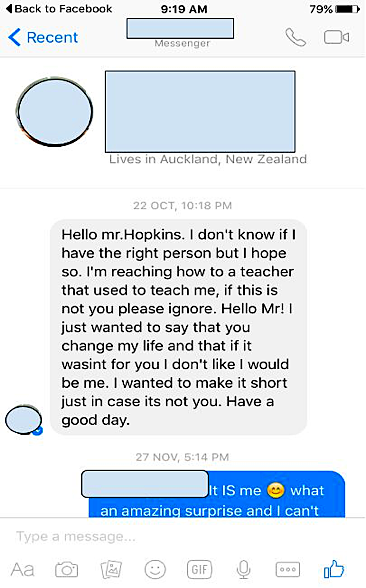 A young man from my time in the classroom had found me. Not only had he found me, he had taken the plunge and reached out, with words that after three months of contemplating, have inspired me to take a moment to reflect on the effect we have on those we teach. How often do we take for granted the connections made in our learning environments? It is not until they no longer feature in our everyday lives that we begin to realise how powerful they are. Not just for the students we guide and watch grow, but for us as professionals. The personal connections and depth to which we connect to students continues to evolve and change as the locus of control shifts and the need to understand the learner on multiple levels becomes increasingly important. Emotions are integral to learning as recognised in the OECD Report The Nature of Learning: Using Research to Inspire Practice (2010). It stands to reason that as our practice evolves to reflect some or all of the seven principles outlined in the report, and to ensure that learners remain firmly at the centre of their learning, we are literally going to change lives. But do we realise we’re doing it? I remember the young man who contacted me very fondly. He was an incredible learner who struggled academically but connected easily. He showed more empathy than any student I have ever taught, more kindness and openness than I’ve seen in the majority of my own peers and friends. He was a genuine enigma. And I knew. I knew I had bonded with him and shaped the way he saw the world. Although incredibly grateful for his kind words and thoughts, I knew the connection we formed in a very close knit class, perhaps the closest and certainly the most challenging class I’ve taught, as it stretched my practice and pedagogy, to a realm I’d not previously contemplated or experienced, was one I wouldn’t forget. I will forever be humbled at how such an incredible student let me share his world. Perhaps, in time, I will even find the words to explain that he ‘changed MY life far more than he will ever realise. Our classrooms are often an extension of our personality and passion. We take great pride in the displays we create to show students how fantastic their learning is. The vibrancy, colour, and time invested all directly link to the individual ethos and commitment of the teacher. 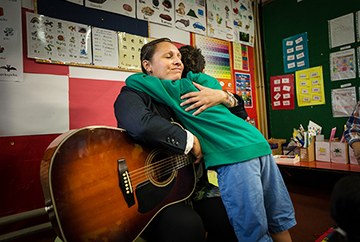 One look at teacher groups on social media shows just how committed New Zealand educators are to making a difference. Whether photos of displays and excited teachers looking forward to meeting their new students, or others sharing tips and bargains knowing just how much we spend from our own pockets every year, the drive and desire to create purposeful, meaningful, and engaging spaces has never been more evident. But, in the end it comes down to the one factor: that all teachers have always been short on — time. So, sometimes we need to stop, to take a break from worrying about achievement objectives and curriculum coverage, and just look at the effect we have. The words we use with our learners last a lifetime. We need to take time to listen and teach our students to learn from their mistakes, whilst balancing the need to let them digest them at their own pace. We need to focus on the opportunities for learning or support given to their individual inquiries. It all starts with how we connect. There’s no doubt in my mind, Simon Sinek’s Golden Circle and his philosophy behind ‘Starting with the why is one of the most genuinely powerful theories I have ever come across. Its simplicity and ease to understand, but complexity in its personalisation is nothing short of incredible. I have continued to use and model establishing a clear ‘why’ for over twelve months, revisiting it with people, discussing elements that may have changed as they continue on their journey, underpinned by strong modern learning practice. As the workload builds and the general busyness of school life begins to take over, how often do we really stop, take a minute and remind ourselves why we do what we do? 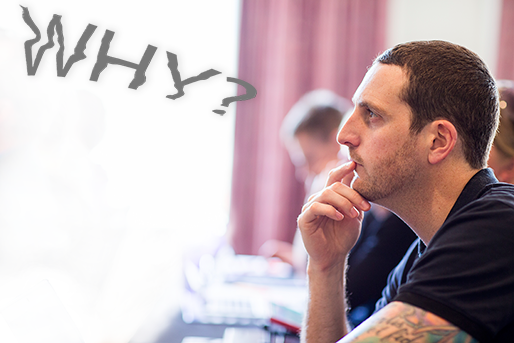 Just last week, I invited a staff to begin thinking and sharing their why. Using The Golden Circle and Sinek’s amazing TED Talk we began to explore people’s motivations and drivers. Some sat patiently listening and digesting the views of their peers; others launched into questioning why they got out of bed that morning, what they wanted to bring to their classroom, and what they wanted their students to aspire to. And quickly they fell into the ‘what’ trap: What they wanted as outcomes, what they believed their purpose and role was. Of course, they could see that the role of the educator has evolved away from the knowledge brokering sage on the stage and one of a guide on the side, but their underpinning elements still revolved around what they wanted their students to achieve. So we stopped. And, I asked them the question again, ‘Why do you get out of bed in the morning?’ I followed it up with, ‘Do you think the why has changed, and is that okay?’ The silence was breathtaking. A room of highly-skilled educators reflecting on why they chose to teach as a profession and then asking whether it was the same reason as they continued, some into their third decade. And it struck them. Like a firework that lights up a cold winter night… Our why can evolve!